That tomato pudding looks interesting...does it really taste good? My summer tomato favorite is gazpacho....I make it every year, each time a little differently. Having a cold, tangy soup on a hot day is just sublime. 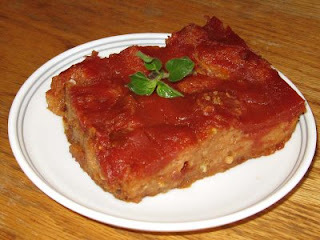 I swear the Tomato Pudding is delish. I love it as a vegetable side dish, especially with pork or chicken. I'm pretty sure you are my new hero!! 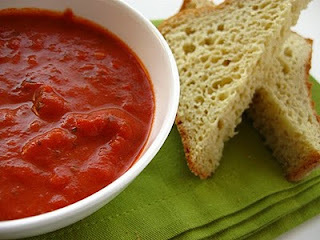 I LOVE tomatoes (which is so funny since I used to hate them), and I've been dying for some good tomato soup recipes. YIPPEE!! You are totally my new hero. I also hate raw tomatoes ( the slimy part with the seeds makes me physically retch) but just cook that little sucker and I can eat my own body weight! My family was asking for homemade tomato soup and I told them I would try to find a recipe and make it for them (personally, I can not stand the stuff.) Well after hearing about this recipe on our book club field trip I decided to try it. My whole family loved it...including me! Thanks so much for sharing the lovely recipe.